Partnership Highlight from CLASS Inc. Hands in the air for one of our favorite community collaborators, Special Stars. Every morning, Samantha Kuczun, owner and director of Special Stars Performing Arts Program, warms up her classroom with her bright smile. Special Stars, which opened in 2014, changed the way performing arts are taught to those with disabilities. It caught our attention at CLASS and individuals began attending the program in early 2015. 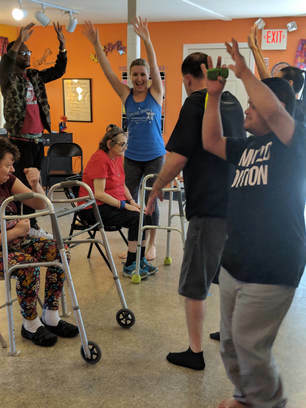 To prepare for each performance in front of friends and family, CLASS participants develop their talents at the Special Star's studio in Salisbury, Mass., for a full month. "Special Stars is dedicated to helping each individual discover their own personal strength, talent, and potential," Samantha says. "Our mission is to provide access to the performing arts for those with special needs. We inspire, encourage, and empower." Students learn to express themselves through creative group music and movement classes to perform in front of an audience with confidence. "In just four short years, we have shared dance, music and acting exercises with more than 300 individuals," she says. "We've also hosted performances at a variety of venues, such as the Blue Ocean Music Hall Tree Festival, the Newburyport Yankee Homecoming Parade and multiple sporting events across New England. "This fall, we're planning a truly inclusive dance program," she continues. "Stay tuned -- we will bring the entire community into our classroom to create interactions with everybody." for helping CLASS redefine what's possible. Charlene and Linda, left, and Jonathan, right, get moving during the dance warm up led by Samantha Kuczun, center. On Friday, July 7, 2017, twenty-one Special Stars performers took centerfield at the Lowell Spinners game against the Connecticut Tigers. Special Stars is a local performing arts program from Salisbury, MA that provides group music and dance classes for those with special needs. The Special Stars performed a pre-game dance to songs like “YMCA,” “Just Dance,” and “Take Me Out to the Ballgame!” The students also had the opportunity to proudly perform The National Anthem for the entire stadium. The Lowell Spinners cheerleaders and ball players cheered the Special Stars on while supporting and congratulating them on their hard work. Since 2014, Special Stars has been redefining the way the performing arts are taught to those with special needs. Students learn to express themselves through creative group music and movement activities while gaining confidence and appreciation for the arts. Personal attention is offered to meet each student’s specific needs and all classes culminate in a live performance for friends and family. Kuczun believes it is important that her students not only perform in the studio, but that they are also giving their talents back to the community. This is the reason that the Special Stars can be seen in local parades, other sporting events, and at the Sea Festival of Trees at Christmastime. In addition to in-studio classes, Kuczun and staff also travel to day, recreation, and residential programs across Massachusetts and New Hampshire that serve those with intellectual and developmental disabilities. Special Stars also has a 501c3 nonprofit, Performing Arts Scholarships and Events, that funds ADA accessibility efforts, sponsorship of students and service providers, performance needs such as t-shirts and props, and the launching of new Special Stars programs in MA and NH. If you, or someone you know is interested in participating or donating to Special Stars, please contact them at specialstarsprogram@gmail.com or check out their website at www.specialstarsprogram.org. It was truly a celebration when on June 29, 2017 over forty Special Stars took the stage for their end of session showcases.